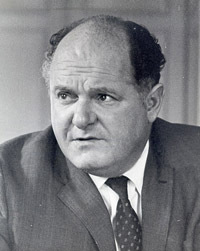 Mr. Eric Wyndham-White was, on 23 March 1965, named to the newly-created post of Director-General of the General Agreement on Tariffs and Trade. Prior to becoming Executive Secretary of the GATT in 1948, Mr. Wyndham-White held important posts in the service of the British Government. He served with UNRRA; he was Secretary-General of the Emergency Economic Committee for Europe, and he was Executive Secretary of the Preparatory Committee for the International Trade Organization and later, of the Havana Conference. He practiced as a member of the English Bar before the Second World War and held a law degree of the University of London.